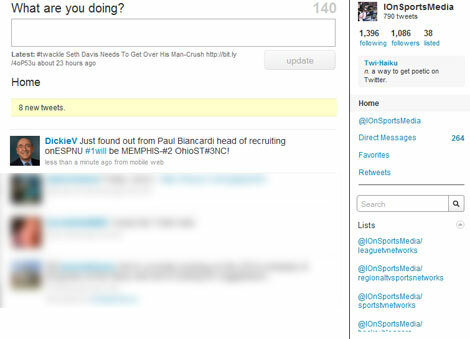 Back in our November 4, 2009 edition of "Sports Media Best Practices", we talked about "Understanding Twitter Lists So You Can Leverage Them." One of the downsides discussed was what looked like the inability to add yourself to your own twitter lists. But there is a sort of non-intuitive way to do it. In this article, we will talk about why you want to add yourself to your own lists, and how to do it. Why Add Yourself To You Own Lists? People might initially think that adding yourself to your own lists is nothing short of ego satisfaction and self-aggrandizing behavior. Maybe so, but it is more than that. If you are using twitter as a branding and marketing tool, you want to expand your reach. As people can follow your lists without following you, you lose out on this opportunity by not appearing on your own lists. Say I am looking for a list on the top social media people/companies to follow. Where would you turn? How would you begin your search? I would start with a trusted social media person themselves to see what lists they created. Then I would start following that list. Done. However, the person that created the list is not on the list since they cannot add themselves. A break in the whole idea. Here is one more example. I follow the PR person that has been tweeting at company A for a long time with great content. To allow themselves to show in a list for their company, they create a new account that will make a list to include everyone that tweets from the company, including themselves. But how does everyone find that list from some unknown, or not yet followed, Twitter id? Listorious? No, a great sit but not the source the average user would find. 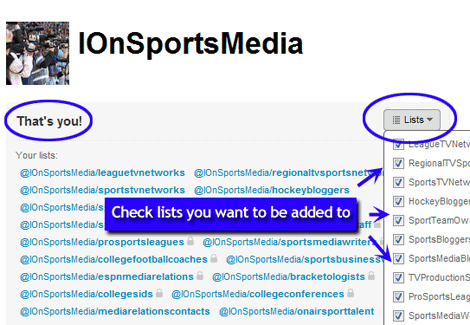 So How Can You Add Yourself To Your Lists? Thankfully, Chris did not let his frustration get he best of him. He found the undocumented (or at least very poorly documented) way to add yourself to your own lists. It really is as simple as that to extend your brand and reach to people who may not be following you, but are following your lists.